"A masterpiece of satire, C.S. 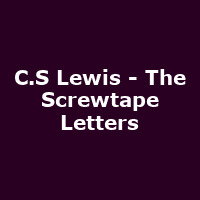 Lewis' classic novel has entertained and enlightened readers worldwide with its sly and ironic portrayal of human life and foibles from the vantage point of Screwtape, a highly placed assistant to 'Our Father Below'. Set in an eerily stylish office in Hell, Screwtape schemes meticulously with his novice demon nephew, Wormwood, who has been put in charge of securing the damnation of an ordinary young man on earth."